Frequent flyers often seem to lead a glamorous life by jetting around the world and visiting exotic cities. More often than not, they may be dealing with unglamorous swollen ankles and pain with the possible danger of having a blood clot. Many flyers have found the best compression socks for travel are very useful on these long flights. Since more people suffer from poor blood circulation than you think, it is always good to be cautious when you are in a cramped seat for a long period of time. If you fly a lot, it is important to make sure that you keep your legs healthy and your blood circulation at a beneficial level. Here are a few tips on finding the best compression socks for flying and a few reviews to help you start shopping. When you are a frequent flyer, you more than likely have had a case of leg pain or swollen ankles after sitting in one position for so long. Sometimes called the “economy class syndrome”, this puts travelers at risk for blood clots and deep vein thrombosis or DVT. If you happen to have a low resting heart rate, you may have slower blood circulation at a higher altitude that leaves you vulnerable to blood clots. Compression socks help travelers by increasing your blood circulation to lessen your chance for blood clots and DVT. In days past, they weren’t the most attractive accessory to wear, but they have come a long way and you can find them in all sorts of color and designs. When deciding on the right compression rating, it is always a good idea to ask your doctor what he or she recommends. Normally, a compression rating of 15-20 mmHg should be sufficient for traveling. A graduated compression sock, which is tighter around your foot and looser as it goes up, is a better compression choice for a long flight. Not only do these socks help promote circulation, but they also energize your legs, reduce swelling, and protect them while sitting or standing for long periods of time. So, if you do a lot of walking while you travel or you stand all day at a trade show, compression socks will be beneficial for you on the ground as well. For those of you looking for a modern and fun compression sock, Sockwell has a new lifestyle look that has reinvented the therapeutic sock. 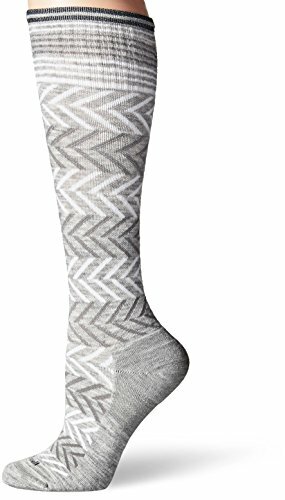 This graduated compression sock will energize your legs, lessen swelling and fatigue while increasing circulation. If you stand for long periods of time or travel a lot, the Sockwell has an anti-fatigue design created to increase circulation with their triple zone. The modern colors and patterns help to make them fun and functional to wear each day. Sockwell offers two compression levels that are perfect for wearing every day including moderate at 15-20 mm Hg and firm at 20-30 mm Hg. Sockwell compression socks are constructed with their signature fiber blends that are durable and environmentally friendly, plus an innovative toe closure with a seamless fit. The Accu-fit technology includes spandex helping the sock retain the same fit wash after wash. The ultra-light cushion sole gives you a comfortable and superb fit and the arch support gives you comfort and a great fit. Your sock will also stay in place all day long with a turn welt top. Let’s take a look at the pros and cons. For a well-designed compression sock, the TravelSox Patented Graduated Compression should definitely be on your list to check out. Designed in Italy, they are the product of a collaborative effort with a medical team to get rid of the feeling of tiredness and swelling for those that frequently travel long distances. They have the perfect compression at 10-18 mm Hg that increases blood flow while lessening swelling and the risk of DVT. They have real graduated compression that starts midfoot for plantar and arch support that reduces the risk of blood pooling. 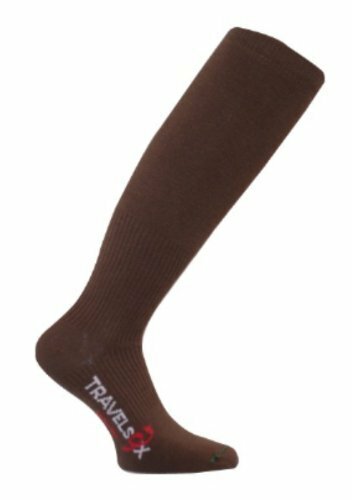 TravelSox compression socks have fibers that stretch more than typical socks, so if you are interested in a tighter fit, you should select the next size down. These machine washable socks usually require two hands to adjust them, so that they can sit right under your knee. TravelSox are perfect for traveling to reduce swelling and stimulate your blood flow. They are also good at eliminating spider veins, edema, varicose veins, plus they reduce cramps and blisters. So, what are the pros and cons of TravelSox compression socks? If you are looking for a better performing compression sock, A-Swift Compression Socks for Women & Men increase blood flow by improving the oxygen delivery to your muscles. You’ll see better performance and faster recovery times while it lessens leg and foot swelling, cramping, and lactic acid production. The A-Swift also helps you to prevent injuries like shin splints, pulled muscles, plantar fasciitis, blood pooling, blisters, calf cramps, and Achilles and heel cup issues. Padding on the top of the foot as well as padding at the ball help to give you more comfort and get rid of foot stress and abrasions. You’ll also get optimal moisture control from the special anti-static and anti-odor silver fibers that also lessen fungi and bacteria growth while keeping your feet comfortable, dry, and blister free, even with longer use. This special anti-bacterial fabric deodorizes while helping you to regulate temperatures by keeping you cold when it is hot and warm while it is cool. The graduated compression is at 20-30 mm Hg promoting faster muscle recovery with better blood circulation with most of the compression focused at your ankle. This is the ideal compression sock to reduce muscle fatigue for those that stand for long periods of time or travel long distances. Here are a few pros and cons of the A-Swift Compression Socks. Sockwell is at it again with the On The Spot Graduated Compression Socks. Like the Chevron Graduated Compression Socks, the On The Spot Graduated Compress Socks have been redesigned to feel more comfortable and include more colors and fun designs for everyday wear. Whether you are exercising, standing or sitting for long periods of time, or travel a lot, the Sockwell’s anti-fatigue design increases circulation with their triple zone construction that energizes your legs by reducing fatigue and swelling. They have two levels of graduated compression including firm 20-30 mm Hg and moderate at 15-20 mm Hg that are perfect for wearing every day. They are constructed with Sockwell’s signature fiber blends that include Spandex for better balance and durability. The innovative toe closure gives you a seamless fit while the non-cushion sole provides extra comfort. The Accu-fit technology gives you the same consistent fit no matter how many times you run them through the washer. For better arch support and socks that will not fall down during the day, the Sockwell Women’s On The Spot Compression Socks are a great investment, especially if you spend a lot of time in the air. So, what are the pros and cons? You can feel the difference when you put on a pair of Travelsox TSS6000 compression socks. They are very versatile working in many different applications including running, biking, rock climbing, and traveling. Improved circulation from your heart to your feet is a benefit for most anyone, even if you are just hanging around the house. 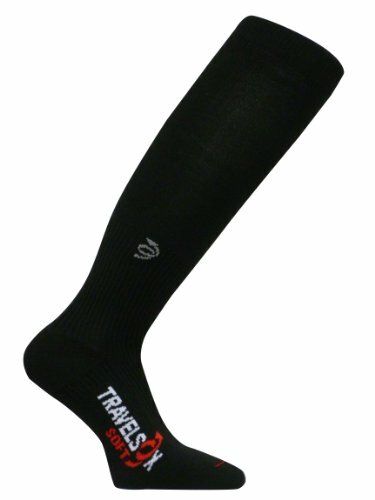 The Travelsox TSS6000 has a unique terry looped toe-to-heel padding system that works similar to a shock absorber. It is constructed with engineered expansion joints giving you comfort and protection without the discomfort of sheering, wrinkling, or bulk. If you don’t want blisters, friction, or rubbing, the TSS6000 features an ultra-thin toe seam, superb ventilation, and the drying wicking capabilities to give you protection from those irritations. These machine washable compression socks also feature silver drystat, a Travelsox Technical exclusive, that keeps fungi and bacteria from growing while wicking away moisture from your feet. You’ll have faster recovery times and better performance with the mid-foot compression that supports the arch, heel, and plantar ligaments that also stop blood from pooling while they support your feet. Whether you want to workout or wear dress socks, the Travelsox TSS6000 has you covered with function and comfort. Here are a few pros and cons. Compression socks work by putting pressure on your legs and feet that helps to lessen the diameter of the distended veins and encourages your blood to flow throughout your body. Unlike regular socks, compression socks are made with strong elastics that place pressure on your feet, ankles, and legs. When you compress surface veins, the blood is then forced to move through narrower circulatory channels increasing arterial pressure and lessening the blood that is pooling in your feet which relieves tired and heavy legs. When choosing the best compression socks for air travel, you need to consider what level of compression you want. There are five levels of compression that start out light and progress up to a heavy level. If you are considering any level over 20 mm Hg, it is always a good idea to consult your doctor. Light (8-15 mmHg) – This level is good for those that sit at work all day and have minor aches and pains. Moderate (15-20 mmHg) – If you are experiencing a heavy sensation or swelling in your legs, this level is should work for you. Firm (20-30 mmHg) – For those that are pregnant or need to relieve varicose and spider veins, this level should be beneficial. Extra Firm (30-40 mmHg) – if you have chronic venous insufficiencies, this level is good at relieving or preventing them. Heavy (40-60 mmHg) – This level is for those with severe medical conditions like varicose veins and edema. Graduated compression socks are good for regular support or prevention for minor issues. TED hose are good for severe medical conditions like arthritis, diabetes, and DVT. Consulting a doctor is not necessary if you are wearing graduated compression socks, but the TED hose are usually prescribed by your doctor. 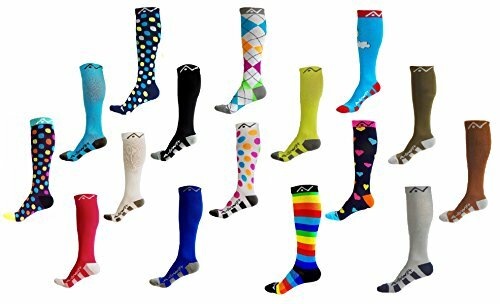 When you are looking for the best travel compression socks, you will usually find that they are made of Lycra, spandex, or rubber. High-quality compression socks will often use Merino wool as well which makes them more durable and fast drying so they are often used by athletes. Your doctor should be able to help you decide which is better for you, but it is mostly just a personal preference. As far as sizing goes, you need to check with the manufacturers and see what their sizing charts say to determine which size will fit you best. For the best fit, compression socks should be snug, especially around your foot, but still be comfortable in your shoes. Tight and snug are two different things, so you want compression to help your blood flow, not so tight it is restrictive. As always, your doctor can help you find the right type and size for our needs. There are two different styles. Either you can choose a sock or a sleeve. Compression socks can come in full length, thigh highs, or knees highs. Most people are interested in compression in a specific area, mainly their ankles and calves, so knee highs tend to be the most popular choice. If you are interested in sleeves, they are available for your knees, calves, thighs or feet and are a good choice for those that don’t want full coverage. If you have plantar fasciitis, foot sleeves are useful. Whatever you choose, it is basically up to your preferences and personal style. Traveling can be exhausting, the last thing you need to have to deal with are swollen and painful ankles. The best compression socks for flying will help you increase your blood flow, so you can get rid of those swollen ankles and prevent dangerous blood clots. Choosing the best compression socks for travel can be the difference between a great trip and one that ends up with serious consequences. So, grab a pair of compression socks for your next flight and sit back and enjoy the comfort. Previous ArticleIs Ginger Ale Good or Bad For You?